Engage is a powerful sales tool, built by Oracle Eloqua, that alleviates the need to constantly re-create emails that are frequently used throughout the sales process. Ensuring sales professionals are using marketing-approved messaging, branding and content, it also allows for personalization and tracking of each email sent. To do this, let's first make sure you have created an "Email Group" in Eloqua with the setting "Make this Email Group Available in Oracle Eloqua For Sales" enabled. 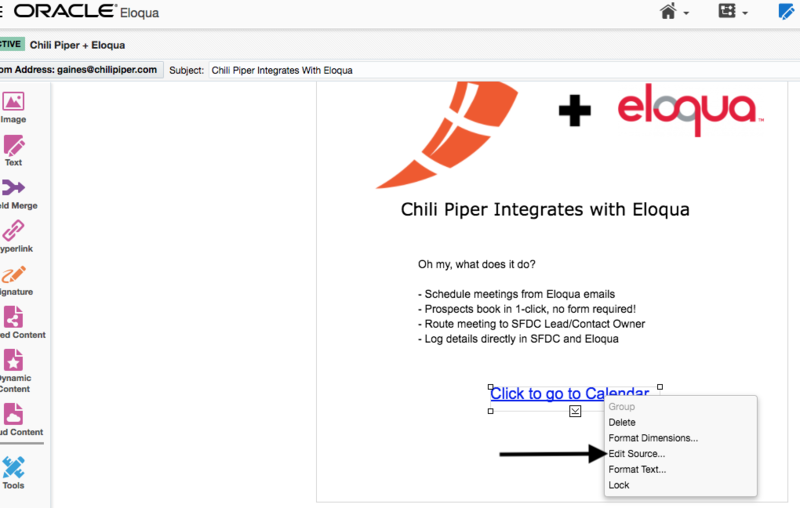 What we're doing here is appending the email address of the prospect to the Chili Piper link via field merge in Oracle Eloqua. This allows the prospect to book a meeting in 1-click, no form fill required. 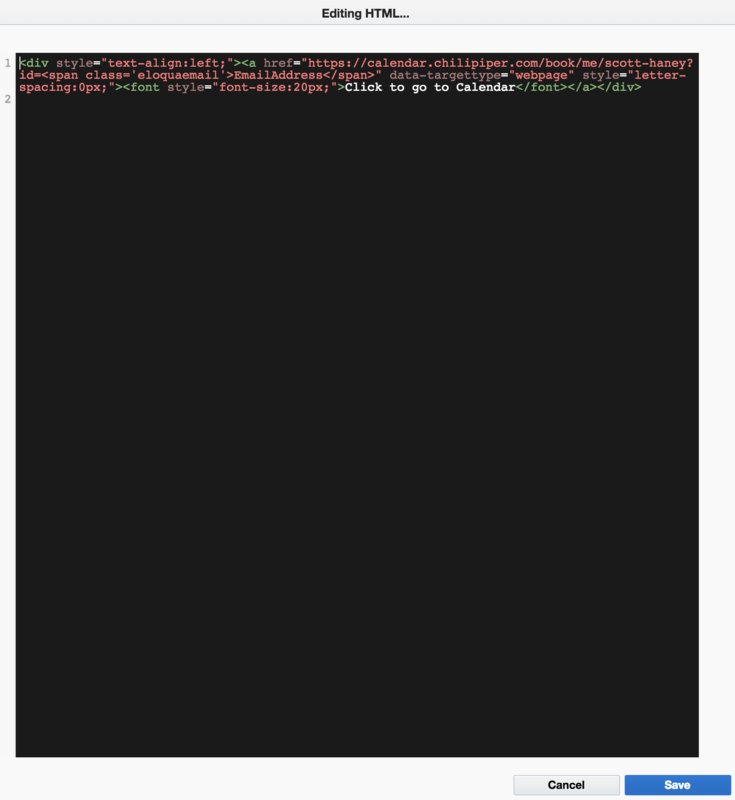 Note: Smart Booking Links work with individual calendar URL's & Queue URL's. If your Queue uses the "Prioritize Based on Ownership" algorithm, then you're able to utilize 1 URL for all your Oracle Eloqua emails, which route the meeting to the respective Salesforce lead/contact/account owner using the Salesforce ownership rules you define. Below features, an example calendar included featuring one of our reps, Scott. Where https://calendar.chilipiper.com/book/me/scott-haney is the calendar link and ?id=<span class='eloquaemail'>EmailAddress</span>" data-targettype="webpage" style="letter-spacing:0px;"><font style="font-size:20px;">HYLER LINK TEXT HERE</font></a></div is the appended email parameter and Hyperlink text. Once example@domain.com gets the email, he/she magically books a meeting with Scott in 1-click and receives calendar invite, no form was filled, Scott receives notification that a meeting was booked, and all the details logged directly into Salesforce.